You may not be able to pick them out of a crowd, but if you’ve ever tweeted at Alaska Airlines, chances are you’ve gotten travel tips from Linnea or football scores from Andre, help with a seat assignment from Michael or an answer to a pre-trip question from Jordan. They’re part of Alaska’s social care team, a small-and-mighty group of customer care representatives listening to customers on Facebook and Twitter Monday-Friday 6 a.m. to 9 p.m. and Saturday 9 a.m. to 4 p.m. PST. The team formed in August 2012, with a select group of customer care representatives with an interest in social media. They rotate shifts between answering questions on Twitter and Facebook and answering customer care phone calls. The social care team works closely with Alaska’s social media marketing team: David Scotland, Alaska’s manager of search and social media, and Shannon Johnson, Alaska’s social media specialist. Together they plan content, strategy and promotions for Alaska’s social channels. And for those who want to be heard – @AlaskaAir is listening. What is your favorite part of your job? Being able to enhance the travel experience of our passengers. What is your favorite subject to help customers with, or topic to chat with them about? I love talking to our customers about their travel destinations and travel experiences. They always get so excited about it and that’s great. It’s awesome knowing that we helped give them that amazing experience. Tell us where you like to travel or the wackiest adventure you’ve ever had: My favorite place to travel would have to be Las Vegas. I’ve been all around the U.S., Canada, and Mexico and nothing compares to the atmosphere in Las Vegas. We stay at the SkyLofts at MGM Grand every time we go and love it every single time. I like to “people watch” and there is no better place to do so than Sin City itself. In 2013 I went to Las Vegas 33 times … I’ve cut back this year. What is your favorite part of your job? I enjoy hearing about our customers’ vacations. Many have gone to places that are on my bucket list, so I enjoy hearing about their adventures and getting travel tips. What is your favorite subject to help customers with, or topic to chat with them about? I like it when I can just talk with customers about their trip as if I was their friend. Tell us where you like to travel or the wackiest adventure you’ve ever had: I’ve had an annual pass to Disneyland for several years, I usually get down there at least 3-4 times a year, if not more. What is your favorite part of your job? I think it’s great that we listen socially any time our name is involved. We can be there for our customers and can solve situations immediately. We are problem solvers from A-Z throughout our company for our customers. What is your favorite subject to help customers with, or topic to chat with them about? I enjoy coming to the rescue of our passengers. There is no greater feeling than turning a negative experience into a positive one. It’s fulfilling for the customer and for myself. Tell us where you like to travel or the wackiest adventure you’ve ever had:: My wife and I just became empty nesters, so I predict many travel stories in our future. We love Cabo and visit regularly; it’s the closest resort destination to Seattle. My wife is big into jumping photos. I don’t know how it happened, but I find myself in many jumping photos. At first I resisted, but as she likes to remind me, Happy Wife = Happy Life. What is your favorite part of your job? 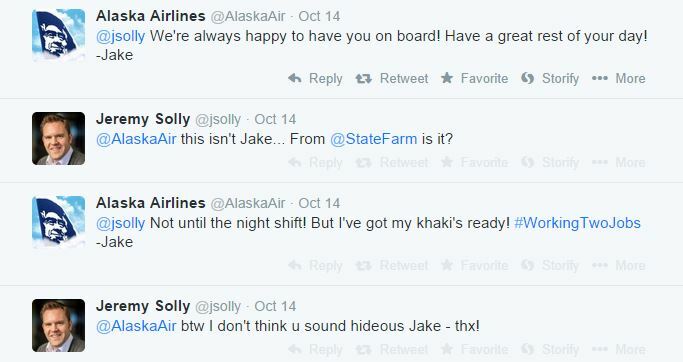 My favorite part is being able to interacting with customers on social media, helping make their flight a better experience. What is your favorite subject to help customers with, or topic to chat with them about? It’s always nice to get positive feedback from customers on social media after helping them resolve a less-than-positive situation. It’s a great feeling to know that you have made a difference. Tell us where you like to travel or the wackiest adventure you’ve ever had: One of the most memorable travel experience I ever had was when I had traveled down to Mexico with few of my friends during spring break. We were traveling from Acapulco to Ixtapa/Zihuatenejo to catch our flight. We had to take a bus full of all sorts of animals and livestock. How long have you been part of the social care team? 8 months. What is your favorite part of your job? Talking with people from all over and showing them what Alaska is all about. What is your favorite subject to help customers with, or topic to chat with them about? I love talking with “AvGeeks.” You learn a lot of crazy things about different types of aircraft. Tell us where you like to travel or the wackiest adventure you’ve ever had: Hmm … well I’d love to go to the Midwest during tornado season and chase storms. However my wife is not thrilled about that, so I’m back to the drawing board. I think the craziest travel experience would have to be when I traveled to Japan when I was 13 years old. It’s truly amazing over there. I was with my host family and they wanted to give me their take on an “American breakfast.” This consisted of Frosted Flakes and a nice cold glass of Coke. Needless to say, it was the best breakfast I could ask for as a 13 year old. What is your favorite part of your job? Social Care. What is your favorite subject to help customers with, or topic to chat with them about? I love the pictures and the excitement customers experience during travel. Tell us where you like to travel or the wackiest adventure you’ve ever had: I enjoy everything about travel. Best trips so far include Italy, Scotland and the Virgin Islands. What is your favorite part of your job? I like surprising people with quick and helpful responses. What is your favorite subject to help customers with, or topic to chat with them about? I like when customers ask for advice about what to do at a destination. I recommended a specific hike that I tried on Maui and a few months later the woman came back to tell me that she went and loved it! Tell us where you like to travel or the wackiest adventure you’ve ever had: I went to Punta Cana, Dominican Republic in August for the first time! I loved it and will definitely go back. The resort was fabulous and I totally recommend it … it’s called Excellence Punta Cana. What is your favorite part of your job? Interacting with our customers on a personal level. It is like making new friends every day and sharing vacation time with them. What is your favorite subject to help customers with, or topic to chat with them about? Planning trips and looking for interesting things to do. Tell us where you like to travel or the wackiest adventure you’ve ever had: I love to travel to all the places Alaska flies. My new favorite thing is chasing the Northern Lights. Me and two friends will keep going to Fairbanks until we see a really good show. This year we are planning to fly to Barrow, Alaska, and hopefully see an amazing light show and just maybe a polar bear. These same two friends and I travel to different cities on the Alaska route to do mud runs. We do have some fun times. 6 comments on "Meet Alaska’s social care team"
I am an Alaska Airlines retiree and can safely say there isn’t a finer company to work for. A class act in all respects. I am proud to have been a part the Alaska team. I constantly promote the carrier’s superior service and wish them every success in their future expansion efforts. Hope that smiling Eskimo keeps flying high and wide! Greetings from Flight 18 on the way to Orlando. I’m spending more time in seat 17A this month than in Seattle, BUT I’ll be Gold for 2015 by the end of the month, so it’s all good, right?! I grew up with Alaska Airlines in the NW and miss you terribly in Nashville, TN. When will you be joining us in the South – TN that is? Why is Alaska not going out of San Francisco to Cabo direct. San Jose is such a harder airport to get to and out of. We have been going to Cano for years out of SFO and now they open an outlying airport for passengers in the North bay or transfer in LAX. Does anyone know if SFO will open to direct soon to Cabo?